The Transit was an annual publication of The University of Iowa College of Engineering (and its predecessors). It was unusual in being a scholarly journal edited by undergraduate students. Most of the authors were members of the faculty at Iowa and former students in various fields of engineering practice. There are many more volumes than those listed here. The gaps in this digital edition will, in time, be filled in. Some of the earliest volumes have been digitized and can be read here. Physical copies of volumes 32-78 can be requested from the library catalog here. From 1910 until the late 1980s, MECCA Week was an annual celebration of the College of Engineering to honor St. Patrick. The celebration was marked by official events, awards, parties, scavenger hunt for the Blarney Stone, competitions, and pranks against the law students. The tale of St. Patrick as an engineer began at the University of Missouri in 1903. Engineering students were lamenting the fact it was such a long period between holidays and professors were giving them a heavy workload. They decided that St. Patrick was an engineer because he removed the snakes from Ireland, therefore, St. Patrick’s Day should be an engineering holiday. Their celebration included a march of the engineering students to the chapel where they found (a person costumed as) St. Patrick, a knighting ceremony, a Blarney Stone, a parade, and St. Pat’s Ball. The link above is to the blog of MECCA Week that just touches the highlights of the full MECCA Week history written by James Cox. Since the 1920’s IIHR has been a leader in hydroscience and engineering research. 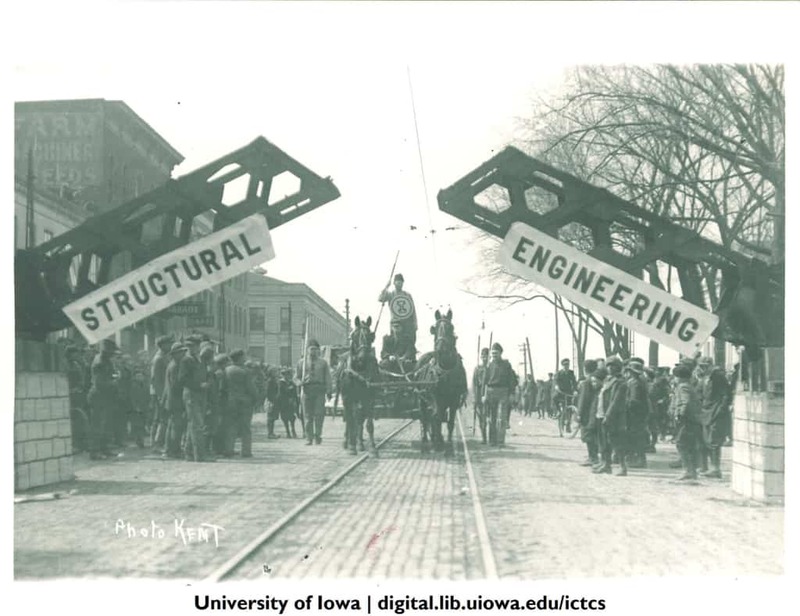 In 1926, they began producing the State University of Iowa Studies in Engineering also known as IIHR Bulletin to highlight some of the research. The collection of those bulletins, from 1926-1971, can be found on Iowa Research Online. For a full history of IIHR- Hydroscience & Engineering visit their history page! Seventy years ago, a class of Iowa engineers celebrated, graduated, applauded their parents and professors, and looked forward to successful futures in an honorable profession. Cutting-edge radio technology and innovative industrial design had made engineers America’s darlings, and for almost a decade, the country had witnessed unprecedented economic prosperity. But members of the class of 1930 also felt the shadow of Black Thursday—October 24, 1929. There is no account of the full burden of the Great Depression on these young graduates. Yet a remarkable series of documents written by Iowa’s 1930 mechanical engineering alumni has preserved their thoughts about their education, early careers, and personal lives during the difficult years immediately following graduation. Chatty, descriptive, funny, and poignant in turn, these unique memoirs are informative windows into the past. 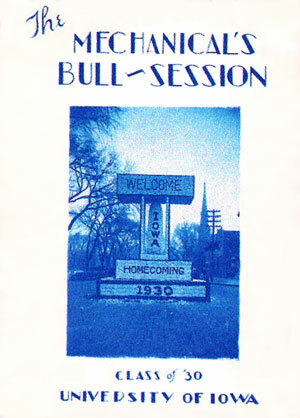 The story of “The Mechanical’s Bull-Session,” as the collected letters were titled, began with C.O. Croft, professor and head of mechanical engineering. Shortly before graduation, Croft proposed that the 10 members of the class of 1930 write annual letters summarizing what had happened in their lives during the previous year. One classmate, Wallace (Wally) E. Nelson, was chosen by his peers to print his classmates’ typed “annual reports” onto blueprint paper, then bind and distribute the booklets to all who contributed. The project met with enthusiasm, and with various members of the class serving as editor, the booklets continued to be produced until at least 1938. The Mechanical’s Bull Session can be read here. The organization of the Engineering College isn’t the only thing that’s changed. The Iowa Transit has been retitled the Hawkeye Engineer. Our original title, The Iowa Transit, embodied a rich heritage of over eighty years. The Transit was founded in 1890, when Engineering was a department within the College of Liberal Arts. In those days there were only two types of engineering: military and civil. Over the years the emphasis of our magazine has changed and our College has grown. Our new title, Hawkeye Engineer, readily connects the magazine to engineering and to one of the oldest lines of tradition of the University of Iowa – the Iowa Hawkeye. We shall, however, continue the tradition that our magazine covers College and student-related news and views as it has through its past. Hawkeye Engineer continued to be a student edited and published journal from 1974 to 2006. The number of issues published each year would fluctuate over the course of its run. The Hawkeye Engineer‘s catalog record can be found here. Also, can be found in the bound journal section of the Lichtenberger Engineering Library under Hawkeye Engineer.